20 miles south of Oklahoma City lies the city of Norman. Norman is a beautiful city with a knockout combination of college town energy and small-town charm. An accouterment of world-class amenities and bustling nightlife locks in Norman as one of the best places to live in Oklahoma. The historical presence of the University of Oklahoma campus and athletic facilities (home of the Oklahoma Sooners) is felt and supported by the locals. Business Insider ranks Norman as one of the Top 30 college towns in America. Beyond that, Norman is considered one of the Top 50 cities for entrepreneurs, being in the Top 10 when it comes to growth in high-wage jobs. It’s hard to argue that owning a home in Norman means becoming part of an exceptional community. This guide will help you navigate Norman, OK as a potential buyer of real estate! People of all ages move to Norman for a variety of reasons, whether it’s the outstanding educational institutions (Norman has a fantastic public education system), the unique “vibe” of the city, or the myriad of work opportunities that city has to offer. According to niche, one resident describes it as an “interesting mix of people, mindsets, lifestyles and age groups,” while another claims that it really “feels like 3 cities in 1.” These testimonials may give you a small hint at what to expect from Norman. Statistically, there is clear evidence this is a college town. 44% of residents are single, 48% rent, and the median age is 33, according to Trulia. These statistics indicate the area is youthful and full of new ideas. Want to learn more about Norman? Check out the city’s homepage. 2. What types of amenities are in Norman? As we’ve said before, Norman offers a variety activities that appeal to a wide range of people. If you’re in the mood for food, then you certainly won’t be disappointed. This city is home to establishments like Ray’s Smokehouse BBQ, whose award-winning pulled pork and brisket are some of the best in all of Norman! If you’re in the mood for something inexpensive and laid-back, The Diner is well-regarded for their traditional American and Tex-Mex fare which is available for both dine-in and to-go. Want some classic and upscale? Try The Whispering Pines Inn Restaurant. While a bit unassuming from the outside, this restaurant offers a variety of continental cuisines and is perfect for everything from special occasions to business dinners. These three restaurants are just a taste of what the area has to offer. What else does this city have to offer? To start with, over 55 neighborhood and community parks. Our top three picks would have to be Andrews Park, Reaves Park, and Lake Thunderbird State Park. All of these parks are wonderfully scenic and perfect for outdoor activities and picnics. The State Park stands out for its unique activities such as fishing, as well as over 11 miles of equestrian and hiking trails. If the outdoors aren’t quite your style, you should check out the Sam Noble Museum (part of the University of Oklahoma). Not only is this museum rated the Number 1 place to visit in Norman, its wide range of rotating exhibits, from Natural History to World Culture, keep patrons of all ages returning again and again. If your passion lies more in art, our recommendation would be the Fred Jones Jr. Museum of Art. This museum houses a variety of collections and exhibits, showcasing art from around the world. It is one of the most outstanding university art museums in the US, with a growing collection of over 17,000 pieces. Photo Taken by Thomas Shahan. And lastly, how could we forget the Oklahoma Memorial Stadium? Possibly the jewel of Oklahoma University, this stadium serves as the home of the Oklahoma Sooners. If you take any pride in supporting your local sports team, you’re going to want to catch a game here. With the capability hold over 85,000 attendees, this stadium is one of the largest in the US. 3. What is the average Norman home like? As with most suburban areas, real estate data shows the “average” property in Norman is a 2-3 bedroom, single family home worth around $180,000. Only about 20% of the homes in Norman were built in 2000 and later, with the majority (50%) being built between 1940 and 1999. This leads to a historical feel that is not usually found in suburban areas. Despite the fact that Norman is certainly considered a college town, apartments only make up about 20% of the homes in the area, with townhomes being at a minuscule 4%. These lower-than-expected percentages are a bit surprising, considering the large number of students in the area. The students University of Oklahoma alone comprise nearly a quarter of the entire city’s population. Even so, almost half of the residents in Norman are renters. 4. How has the housing market been in the past? Over the past five years, standard real estate metrics like appreciation rates and price per sq footage have been steadily rising. These numbers indicate a healthy market, ensuring that your investment becomes more valuable as inflation and other negative factors rise. As of writing this, in the last year alone the median sales price of homes has risen over 6%. As you can see from the graph below, a steady upward trend of median home prices has been the pattern for quite some time. This graph shows the median house prices in Norman over the past several years. 5. How is the current Norman real estate market? Currently, Norman could be considered a “Neutral” market, neither a “Buyer’s” or a “Seller’s.” What’s great to know about the real estate market is an even balance between renters and owners. This indicates that there are excellent properties on either side to cater to your needs and lifestyle. Regardless of your criteria for your residential area or neighborhood, Norman is sure to meet them. For an excellent, regularly updated resource on the current housing market, check out these market trends. 6. How does the Norman housing market look for the future? While no one can honestly know what direction the market will take, it’s safe to assume the positive trend will continue. Appreciation values of homes have skyrocketed nearly 22% over the past ten years, placing it in the top 20% across the United States for home appreciation. Additionally, home foreclosure rates have decreased alongside homes with negative equity. 7. What are some quick tips you can offer me on Norman? 8. What else should I know? Take your time, but not too much! Buying any property is a significant decision. As such, rushing quickly through the process could lead to disappointment soon after. Conversely, if you take too much time, any desirable property could slip through your fingers. Stay emotionless. We understand the search for a new home is exciting. Enjoy that! However, moderation is still crucial. When you walk into a house, get swept off your feet, and swear off all other options, you place yourself at a severe disadvantage. Keep your options and rationality open. Use a professional realtor. Over 90% of housing sales involve a full-time realtor for a good reason. A professional realtor will get you the results you desire while minimizing any headaches along the way. Be sure to work with a realtor who possesses extensive experience and innately knows the area. Contact us today, and we promise you a second-to-none real estate experience. 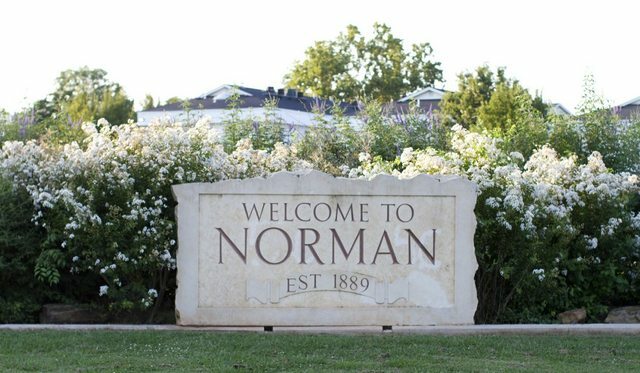 Whether you’re considering moving to Norman in the near future or have been a resident for some time, we thought it would be an excellent idea to write a short guide just for you. With this guide, we aim to be a primary resource when it comes to discovering Norman. In 1870, the territory of Oklahoma was to be surveyed. A young surveyor by the name of Abner E. Norman was head of the central survey area. When the “Sooners” (those who decided to head west before the Oklahoma Land Rush of 1889) arrived in central Oklahoma and eventually settled there, they decided to name the area after the young surveyor. And thus the city of Norman, Oklahoma was born. As a matter of convenience, Norman developed around the Santa Fe Railroad. Its position along the route made it a prime spot for loading both passengers and freight goods, and eventually, Norman grew to become a headquarters for the railway. As time passed and businesses grew, Norman expanded several times alongside them, with the final expansion taking place in 1909. To this day, the Santa Fe Depot serves as a historical site that functions as is maintained as both an art space and a rental facility for banquets, meetings, and parties. The depot also serves as an Amtrak station. Norman’s growth led to the flourishing of a prominent city. While neighboring towns were more concerned about which would be the capital of Oklahoma during this time, the mayor of Norman decided to pursue a bill which cemented Norman as the site of the state’s first higher learning institution: the University of Oklahoma. Residents of Norman donated a collective 40 acres of land to accommodate the campus site. By 1895, the university had 100 students enrolled; quite a small number compared to today’s count of over 30,000. To this day, the City of Norman is still a place where history is made. Norman is one of the most progressive cities in Oklahoma, and the Norman Public School system is known as one of the best in the state. Norman prides itself on maintaining its image with projects such as downtown revitalization and Norman 2025 and strives to make history with each passing year. Alongside a rich history, Norman boasts a rich variety of food options! Not overly-saturated with fast food joints, Norman has become a home to several independent restaurants, ranging from classic Italian to delicious Tex-Mex! The following are a handful of places you must try, whether you’re a resident or just visiting! Led by Executive Chef Anthony Compagni, Benvenuti’s high-end menu takes full advantage of local ingredients to feature delicious Italian meals. The restaurant has a classic feel to it, being housed in an older building. It even features a patio out front where you can enjoy your meal outside. Speaking of meals, Benvenuti’s caters to a variety of tastes with a wide range of salads, pizza (gluten-free available), and pasta (made in-house daily); Not to mention other Italian classics such as their grilled lamb rack and chicken marsala. Make sure to save room for dessert as well! Their creme brulée and triple chocolate mousse cake are amazing! Sriracha Shrimp is a popular choice at Benvenuti’s! A family-owned cafe, Tarahumara’s serves up delicious Tex-Mex fare that never ceases to impress. Located near Frances Cate Park, this cafe is a favored spot for not only food but drinks as well! It’s not a rare sight to see the cafe packed and buzzing with energy, with its patrons having a margarita or bloody mary in hand. It’s large-portion dishes come with sides of rice and beans, cheese sauce, and homemade salsas. Some of the local favorites are the fajitas, the enchilada, and for dessert, the traditional sopapillas! Be sure to stop by, as this restaurant is excellent for dine-in and take-out. Tarahumara’s Mexican Cafe is a popular night spot in Norman. We’ve mentioned Ray’s Smokehouse BBQ before, and there’s no reason not to again! This family-owned establishment continues to live up to its reputation as a relaxing place to eat some delicious food. When it comes to choice, you really can’t go wrong, though our recommendation (and theirs) would be the brisket or the ribs, with a side of baked beans, collard greens, or fried okra. Ray’s continues to impress the locals and has become a hotspot for students as well! Great for dine-in, carry-out, and even catering, this restaurant is committed to getting their food on your table. You can pile your plate high with bbq and sides at Ray’s! While Norman is host to some incredible dining establishments, it also features over 55 neighborhood and community parks that offer a variety of outdoor activities to the locals. Here are some of our choice spots! Lake Thunderbird State Park features two marinas (Calypso Cove Marina and Little River Marina), nine boat ramps, and two swim beaches. These amenities make it the go-to spot for water activities of any kind! Not a fan of the water? This park also includes over 200 RV sites, as well as restroom facilities and traditional campsites. A collection of picnic sites and playgrounds also make it a desirable spot for family day trips. Some of the picnic areas are even available for reservation through the park office! Lastly, this park features several miles of walking, hiking, and mountain biking trails for your enjoyment! If you enjoy spending your time among wildlife, the George M. Sutton Wilderness Park is the place for you! Travelling along the wooded trails of the park you’ll be able to spot locals such as Texas horned lizards, white-tailed deer, and a variety of foxes. Visitors often bring binoculars in hopes of spotting a few of the 200 species of birds that frequent the park. If searching for wildlife isn’t your style, the George M. Sutton Wilderness Park is an excellent place to roam around. Comprised of over 160 acres, visitors often lose themselves in the natural beauty of the various plantlife of the park. The George M. Sutton Wilderness Park is a great spot to see some Norman Wildlife! As a city steeped in history, it’s only natural that Norman developed a thriving arts and culture environment. From a variety of museums and theaters to public art displays, finding a place to scratch that arts itch isn’t hard. As a part of the University of Oklahoma, The Fred Jones Jr. Museum of Art is considered one of the nation’s best university art museums. This museum boasts a permanent collection of over 16,000 pieces, containing examples of French Impressionism, 20th-century American sculptures, contemporary art, Native American art, Southwestern art, photography, and Asian Art ranging from the 16th century to the present. This museum also offers temporary exhibits that rotate every few months. The Fred Jones Jr. Museum of Art is an excellent spot for a family outing, mainly since admission is free for all ages. Opened in 1929, The Sooner Theatre cemented itself as the first movie theatre in the region built for cinema. This Spanish Gothic-Style theater was a gem of Norman, as no expense was spared in its construction. Located on Main Street in Norma’s historic arts district, today the theater offers year-round events including musical theatre productions, touring concerts, and art classes! If you glance at their events page, you will find that something is almost always happening at this historic arts center. Exterior of the historic Sooner Theatre in Norman. If you’re a fan of new music, then you should expect to visit The Opolis, a local indie music venue regularly. Billed as a “micro venue,” The Opolis features local, regional, and national acts every month. The whimsical atmosphere and full bar cater to a crowd that loves to live it up a bit at weekly trivia nights and lounge shows. The Opolis has an added benefit of being an official venue for the Norman Music Festival, cementing itself as a hotspot in the Norman Music Scene. We created Norman Oklahomes with a single focus, and that is to help you buy and sell Oklahoma homes at the very best prices on the market. We know how tricky it can be for you to get the ultimate value for your money, and it’s even harder to find the right property or promote your sale adequately. Thankfully, we are a team of experts ready to assist you through all the challenges in order for you to get the best results. We know how just hard and demanding it can be to deal with such situations, and we are ready to help right away. How our website can help you? Our website helps you buy or sell your home in no time, and you can easily browse the various communities based on the listing ID, address, postal code or city as you see fit. As a result, you get to receive a very good value for your money, and the experience can be second to none in the end. At the same time, we always try to expand the array of services and that’s why we are here to offer you as much information as possible about various areas, communities and the value that you can get from moving to those locations. Plus, if you want to sell, our team will write blogs that will help you identify the right sale methods which will generate the best possible revenue from each situation. We know that selling a property is not a simple task, sometimes it can be very time consuming. But we are more than happy to offer you the help and guidance that you may need in order to make this a reality. That’s why our team is ready to help, because we know the market and understand exactly what needs to be done in order to sell or buy a home with the utmost success. It’s a tremendous opportunity and one that can bring in front some really good experiences for sure. Starting with this post, you will get a wide array of informative blogs on topics that are interesting for our entire user base. We know that information is crucial when you want to buy or sell a property, and that’s why we are more than happy to assist you with all of that. Each one of the blog pieces that we will write here will be created by professionals with a lot of experience in the industry. That’s what matters the most the fact that once you come to our site, you will get information from vetted professionals, info that will help you make the right choice in no time. By working with our team, you get to harness the 20-year experience, dedication and focus that we deliver to each customer. Plus, we are always fully committed to each project, and we believe that this is the ultimate way to achieve success in any endeavor. We encourage you to read our upcoming blog posts to get more information on the topic, and if you need any help with buying or selling a home, we will gladly assist!